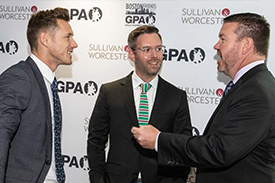 Boston, October 3, 2018 – Aidan Browne, a Sullivan partner and Chairman of Boston Friends of the Gaelic Players Association (GPA), today introduced the hurling organization’s new chief executive, Paul Flynn, at a festive event hosted at the Irish Consulate. "As the sport of hurling continues to grow in popularity, Paul Flynn is the right leader for the GPA,” Browne said. "His business and sporting achievements, combined with his genuine enthusiasm for the game, will attract new fans and supporters. Already, Boston sports fans are getting ready for the third annual Fenway Hurling Classic on November 18." 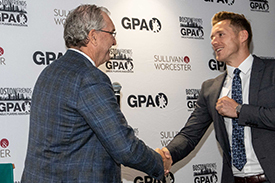 The introduction of Flynn as the new CEO was attended by Consul General Shane Cahill, Judge Frank Bailey and Fenway Sports Managements’ Mark Lev and John Clark, among others. 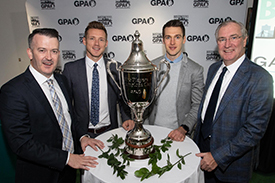 In addition to welcoming the GPA’s chief executive, Browne unveiled a new ad campaign and video developed by Connelly Partners to introduce fans to hurling’s athletes. Titled "You see players, we see people," the spots showcase the realities of life as a professional athlete. 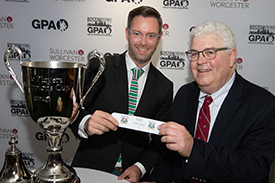 The event also included the announcement by Mary Sugrue, CEO of the Irish American Partnership, of a $100,000 donation to the GPA's scholarship fund. 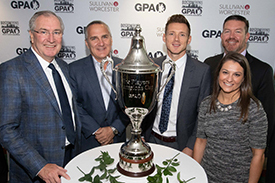 Sullivan has a long history representing and supporting Irish companies. For decades, the firm has worked with and on behalf of the Ireland’s leading banks, investment funds, government agencies and corporations in technology, life sciences and education. The firm also represents a number of high-profile professional athletes who have strong ties to Ireland.